At Weddings By Dzign, we love nothing more than a creative couple—so, when Alena and Brandon asked Weddings By Dzign to help design their Día De Los Muertos wedding, we jumped at the exciting opportunity. The couple chose to marry on October 29th at Las Vegas’ Caesars Palace, which provided a perfect backdrop for their fun and celebratory soirée. The pair chose a sugar skull-themed wedding because of both their love for Día De Los Muertos and their desire to host an offbeat, one-of-a-kind destination wedding that their friends and family would never forget. 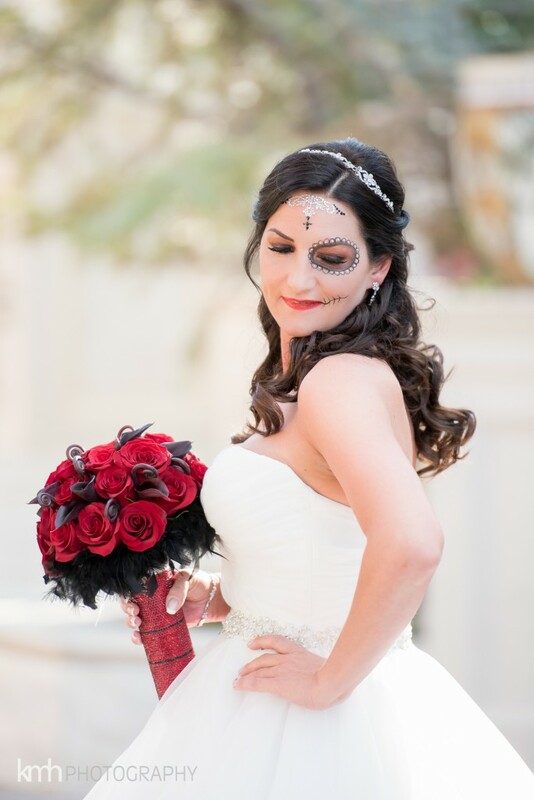 Alena wore a stunning ball gown, which she glammed up with gorgeous Día De Los Muertos-inspired makeup. For her bouquet, Floral By Dzign crafted an arrangement of black baccarat roses and schwartz calla lilies, accented with black furniture curl and black feather collar wisps. 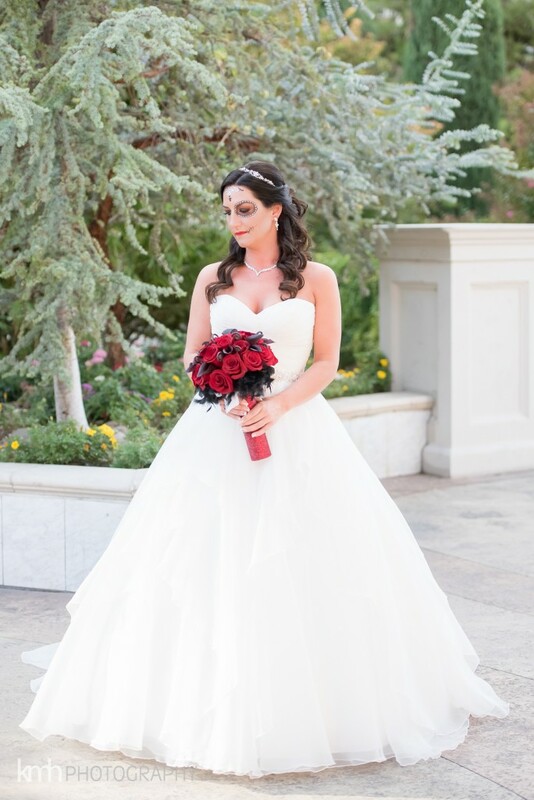 The red-and-black palette played so well into the day’s spooky-meets-glam aesthetic, and the dark, saturated hues of the bouquet looked absolutely stunning against her stark white gown. Bridesmaids’ bouquets consisted of red roses, black feather wisps and black hypericum berries, with a half-stem wrap of black satin ribbon and—to add some sparkle—crystal pins down the handle. 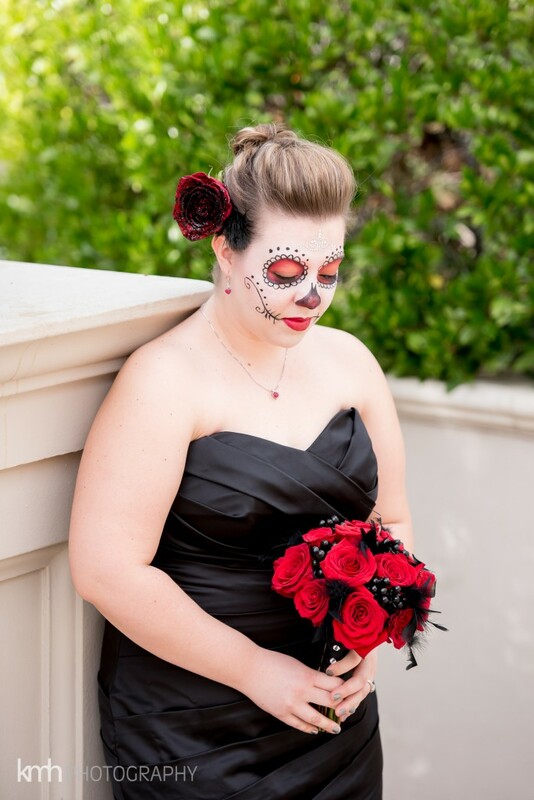 They played perfectly into the bridesmaids’ black gowns and full-face, sugar-skull makeup. We also had a ton of fun creating custom hair pieces for each bridesmaid. 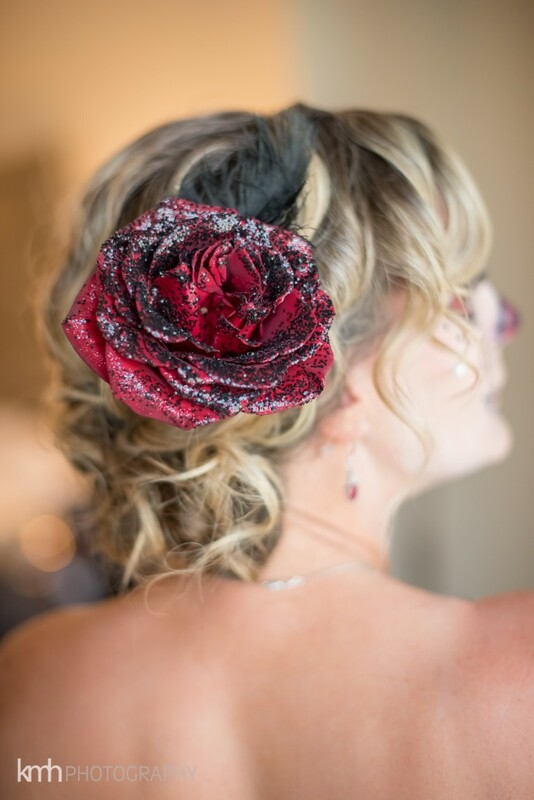 We ended up dipping a red rose in black glitter and accenting the hand-crafted piece with black feathers for a look that was oh-so Día De Los Muertos. Amelia C & Co. did an unbelievable job with the wedding party’s makeup and, when all was said and done, ended up painting 20 sugar skulls on the couple and their groomsmen and bridesmaids. We especially loved the fact that Alena and Brandon each chose to have only half of their faces made up—which cleverly lead to the unpainted half facing their guests during the ceremony. Overall, we never imagined spooky could look so stunning—and we were beyond excited to add this glamorous Día De Los Muertos wedding to the By Dzign books!